It’s no wonder why Kristin is a 5 Star Realtor! She is the Best out there! 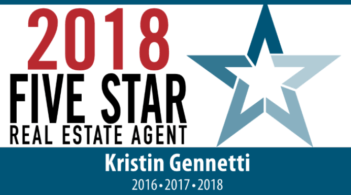 My husband and I were extremely impressed and pleased with Kristin Gennetti as our realtor and we Highly recommend her. From the first time we met Kristin, we knew she was the one that would sell our house. As different issues came up, Kristin was always there to help and would go out of her way. She gathered information and always made suggestions to us and put in the extra effort every step of the way. Even when she was on vacation she was always a step ahead! She is easy to speak with, professional, very devoted and caring. She kept us informed every step of the way and was always available to talk to if we needed her. If we sent her a message or email, she always responded right away. We are so grateful that we had Kristin in the sale of our house. We look forward to working with Kristin again in the future when we look to buy our next home. This is why she is the Very Best out there. You won’t find a better realtor. Thank you, Kristin Gennetti for all your hard work!